Set it and forget it, and you'll be so glad when this crockpot full of chili is ready. 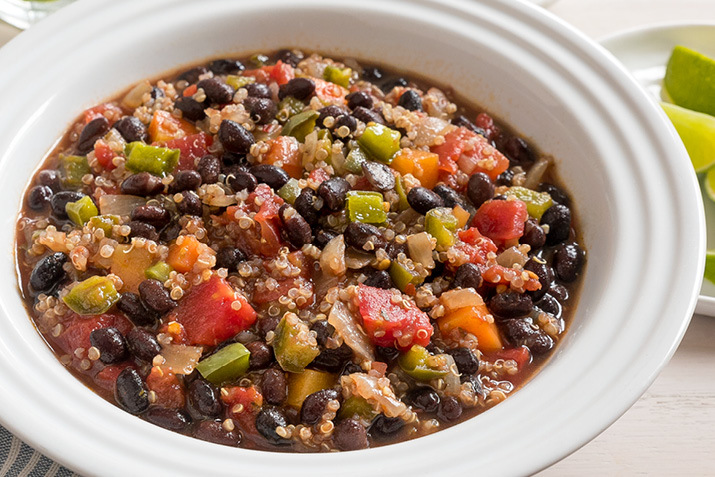 This meatless classic has a little extra texture thanks to quinoa, which simmers in the black bean broth and gives it body. Combine all the ingredients in the slow cooker and close the lid. Set the cooker on low and cook for 6 hours. After 6 hours, test the beans for doneness. If they are not quite tender, cover and cook for another half an hour. Serve hot or transfer to containers to refrigerate or freeze. Cornbread flecked with diced jalapeno peppers makes a tasty accompaniment to this hearty chili.